Completed around 1470 in Bruges, Hans Memling's Triptych of Jan Crabbe was dismembered in the 18th century and has never before been reconstructed for an American audience. Two panels from the altarpiece are among the finest paintings owned by the Morgan Library & Museum, where they have long been on permanent view in Pierpont Morgan’s Study. This exhibition brings together the scattered elements of the famous triptych, reuniting the Morgan inner wings with the central panel now owned by the Musei Civici in Vicenza, Italy, and the outer wings from the Groeningemuseum in Bruges, Belgium. 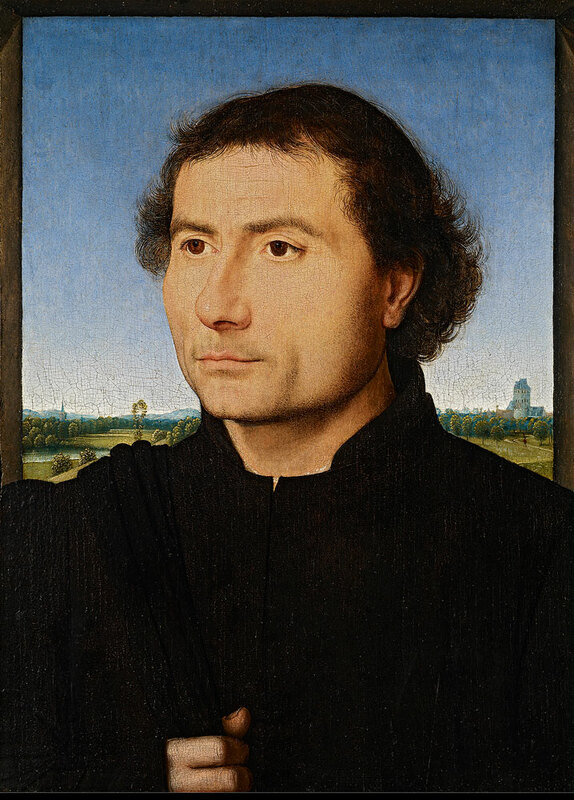 Hans Memling: Portraiture, Piety, and a Reunited Altarpiece is the first museum exhibition to explore the reconstructed masterpiece in context. 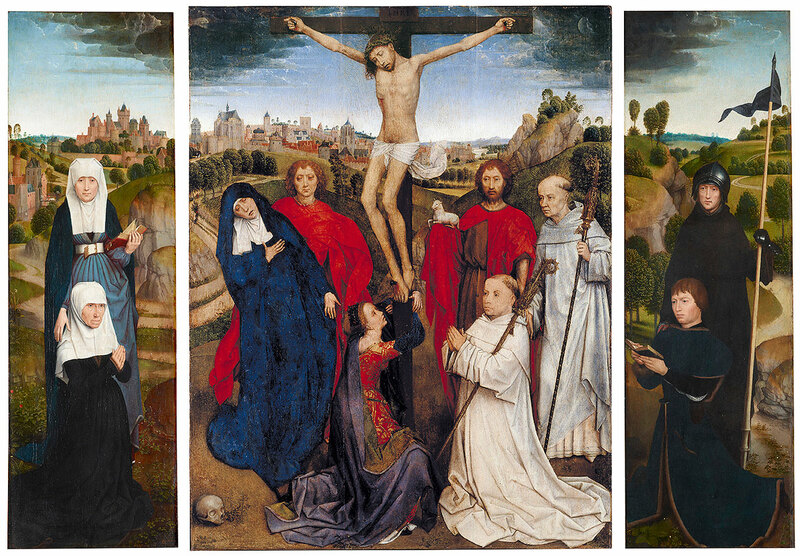 It has long been observed that the donor portraits are the most outstanding aspect of the Crabbe Triptych, especially the portrait of Anna Willemzoon in the left wing, an extraordinary image of old age, and representative of the merging of the sacred and secular realms that is often present in the work of Memling and his contemporaries. Memling was notable as a painter of portraits, and his work in this field revolutionized portrait painting across Europe. To present the artist’s extraordinary ability to capture a likeness, a number of his independent portraits will be shown, including the Morgan’s Man with a Pink. 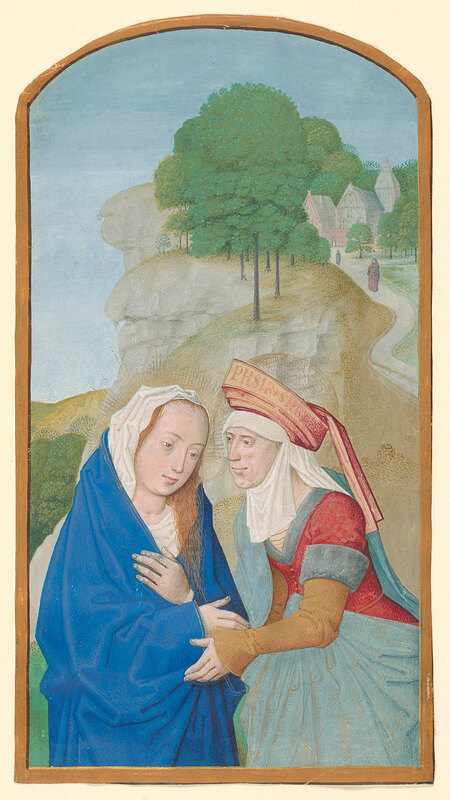 The exhibition also highlights links between panel painting and manuscript painting in fifteenth-century Flemish art, drawing connections, for example, between the grisaille Annunciation on the outer wings of the altarpiece and the grisaille figures that decorate so many manuscripts painted in Bruges during Memling’s lifetime. Underscoring this great artist’s impact, Hans Memling also features Early Netherlandish drawings from the Morgan's collection, works ranging from the early compositional studies and figure drawings to a group of portrait drawings made in the generation after Memling and under his influence. Loans from the Metropolitan Museum of Art, the Frick Collection, and private collections will complement a range of works from the Morgan’s own holdings. 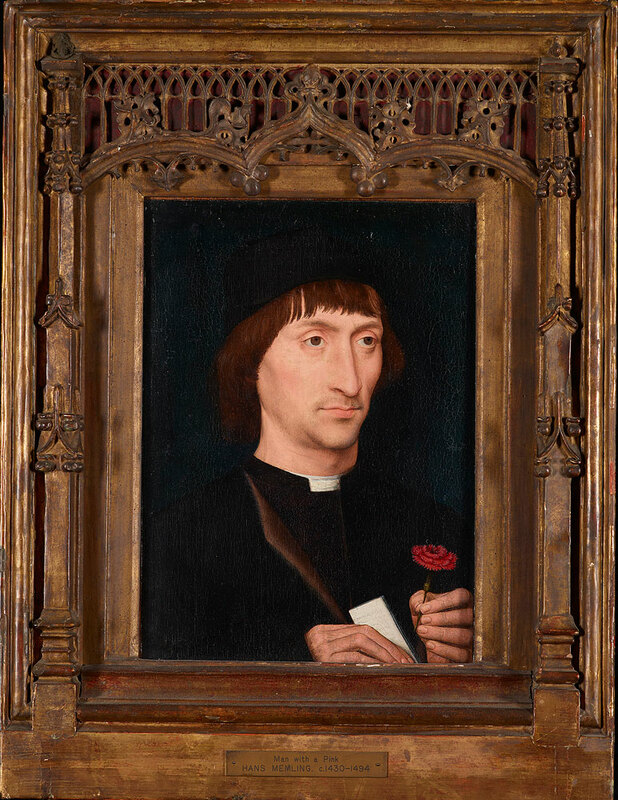 Hans Memling: Portraiture, Piety, and a Reunited Altarpiece is made possible in part by S. Parker Gilbert, whose gift prior to his death in 2015 provided early support for the project. Generous support is also provided by the General Representation of the Government of Flanders to the United States and the Robert Lehman Foundation, with assistance from the Janine Luke and Melvin R. Seiden Fund for Exhibitions and Publications, the Samuel H. Kress Foundation, the Sharp Fund PLD, and Aso O. Tavitian. The catalogue is made possible by the Flemish Research Centre for the Arts in the Burgundian Netherlands, Musea Brugge. Hans Memling, The Triptych of Jan Crabbe, ca. 1470. Oil on panel. Center panel: Image courtesy of Pinacoteca Civica di Palazzo Chiericati, Vicenza. Left and right panels: © The Morgan Library & Museum, Photography by Graham S. Haber. 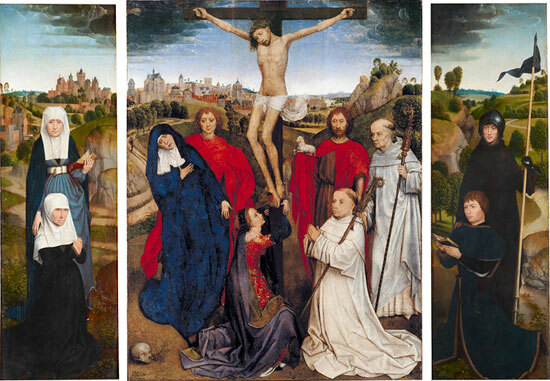 Hans Memling, The Triptych of Jan Crabbe, ca. 1467-70. Oil on panel. Center panel: Image courtesy of Pinacoteca Civica di Palazzo Chiericati, Vicenza. Left and right panels: © The Morgan Library & Museum, Photography by Graham S. Haber. 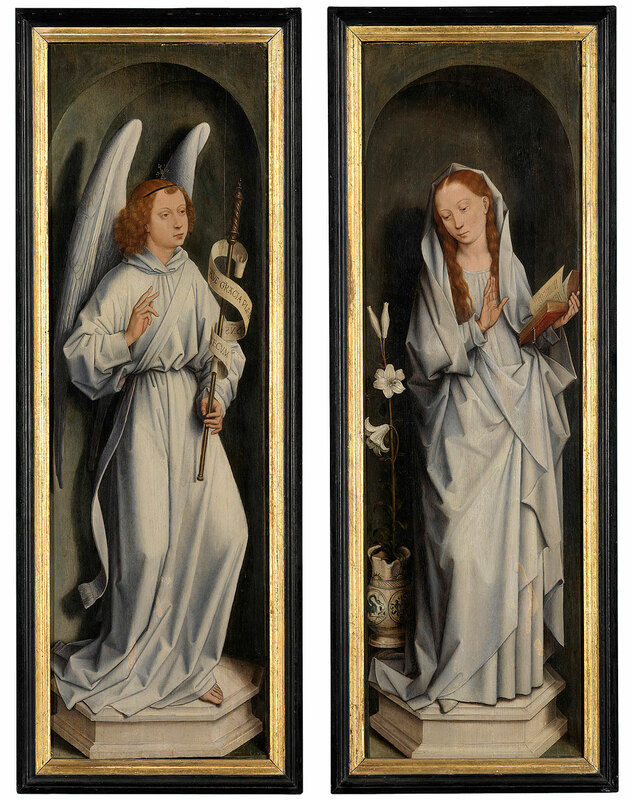 Hans Memling, The Triptych of Jan Crabbe (closed), Annunciation Panels, ca. 1470. Oil on panel Musea Brugge © www.lukasweb.be – Art in Flanders vzw. Photography by Hugo Maertens. Hans Memling (Flemish, ca. 1440–1494), Portrait of a Man, ca. 1470, Oil on panel. © The Frick Collection. Hans Memling (Flemish, ca. 1440–1494), Portrait of a Man with a Pink, ca. 1480–85, Oil on panel. The Morgan Library & Museum, purchased by Pierpont Morgan, 1907. Photography by Graham S. Haber. Netherlandish School (Jan Mostaert?) (Netherlandish, ca. 1475–ca. 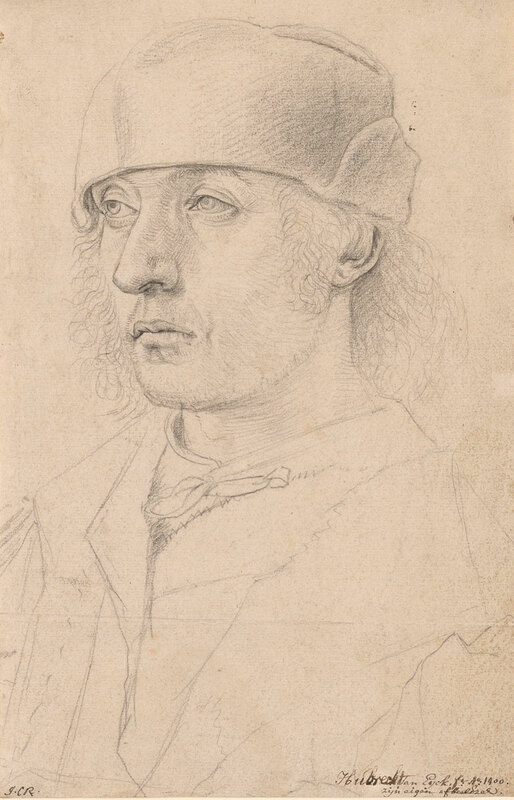 1553), Portrait of a Man in a Cap with Ear Flaps, ca. 1520, Black chalk. The Morgan Library & Museum, Purchased by Pierpont Morgan in 1909. Photography by Graham S. Haber. Workshop of Hugo van der Goes (Flemish, ca. 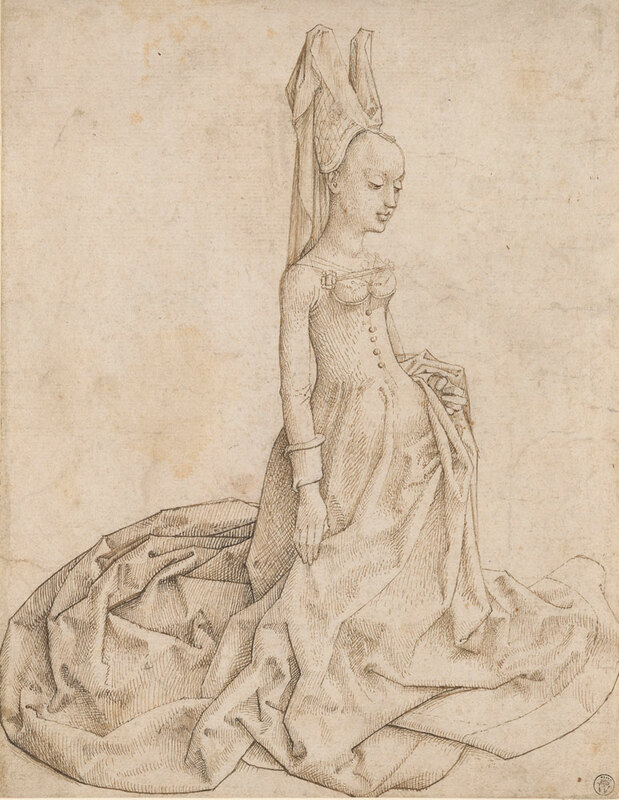 1440–1482), Kneeling Lady, ca. 1480–1500, Pen and brown ink with traces of black chalk. The Morgan Library & Museum, Purchased by Pierpont Morgan in 1909. Photography by Steven H. Crossot. Miniature from a Book of Hours, Belgium, probably Ghent, ca. 1490, Illuminated by Alexander Bening. The Morgan Library & Museum, gift of the Trustees of the William S. Glazier Collection, 1984. Photography by Graham S. Haber. 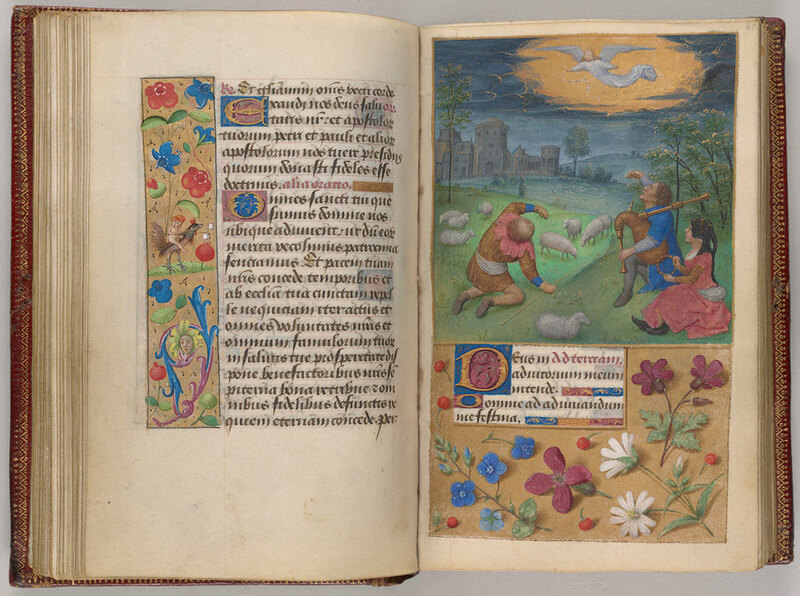 Book of Hours in Latin and French. Northern France and Flanders, ca. 1480. Illuminated by Simon Marmion. MS M.6, fols. 40 and 41. The Morgan Library & Museum, purchased by Pierpont Morgan,1900. Photography by Graham S. Haber.